Kensington, Brooklyn: Woodstock in Prospect Park? As we look through the archives of our many mysterious repositories of information, we came upon this item that we missed while on hiatus. Coming soon to a backyard near you. Well I'm no expert on large-scale festival concerts, but I'm willing to bet that this would create a mountain of garbage so high, even Tommy Chong couldn't see over it. Not to mention turning our beloved long meadow into a giant mud wrestling pit. 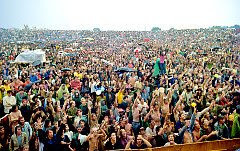 I'm sure you recall that the last time someone tried to throw a Woodstock, a bunch of angsty teenagers tried to burn the place down because they were being overcharged for Evian. I'm not sure turning Prospect Park into a tire fire is a fair price to pay just to see the surviving members of the Byrds trundled onstage in wheelchairs and forced to wheeze into their mikes for 45 minutes. Thanks to Matthew for sending this in.